Welcome to Shareaholic’s Referral Traffic Report. According to our findings based on aggregated data from more than 200,000 publishers that reach more than 260 million unique monthly visitors each month, Pinterest drives more referral traffic than Google Plus, LinkedIn and YouTube combined. The report doesn’t show all referral sources – there are hundreds of thousands – but it does shed some light on where some of the most talked about websites stand. Pinterest grew from 2.5% of referral traffic in December to 3.6% of the referrals in January. That’s impressive growth from just owning .17% of the traffic back in July. Referral traffic from Google+ dropped slightly in January, although Google’s product set (Google news, Google images, Gmail) continues to be a top referral source. Google continues to integrate Google+ into its offering more and more, so it will be an interesting trend to watch. Eyeing its IPO this week, Facebook continues to dominate referral traffic, with mobile traffic alone accounting for 4.3% of overall referrals. Referral traffic grew by about 1% in January, making it the second fastest-growing site for referral traffic after Pinterest. Although Pinterest did beat out YouTube in referral traffic, YouTube’s referrals grew by .07% in January. It’s got to be the Sh*t Girls Say meme. Definitely. 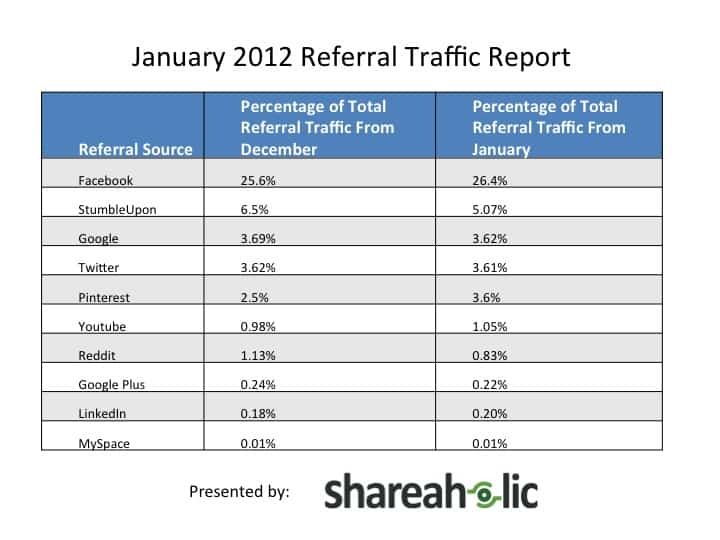 It’s important to note StumbleUpon’s position as the number two referral source. It seems like most people don’t talk or think about it nearly as much as top-of-mind Pinterest and Google+, but it continues its stronghold owning 5.07% of referrals in January. Similar bookmarking site Reddit also ranked as a top source of referral traffic, with both Stumbleupon and Reddit significantly beating out Delicious and Digg. Lastly, it’s always interesting to check in with the once-powerful MySpace. It continues to linger as a small source of referral traffic with no sign of growth this month. It’s the end of the month and the perfect time to dig into your analytics and measure the effectiveness of your content efforts so far this year. You may notice new trends in keywords or traffic sources, or get validation on a current content strategy you have to drive traffic. Learn about where your content gets shared the most with your Shareaholic website profile, and find out which of those sources drives referrals under Traffic Sources/Sources/Referrals in Google Analytics. These are great general findings, but it is most important to learn about your audience and your website. Figure out what’s working and what isn’t, and alter your approach accordingly so you make your content even more successful as the year progresses. Curious to see updated figures for our Traffic Reports? Check out our recent studies. Have questions? Email press@shareaholic.com.